Today Codexx published the final report on a study of innovation in 35 UK and German law firms, carried out in 2013 with the support of the University of Exeter Business School and the University of Leipzig Graduate School of Management. The objective of the study was to understand the current level of innovation, the methods being applied, the results achieved and the challenges faced by law firms in these two countries. Participating firms have already received a copy of the report, including their scoring in the study, to help in their innovation activities. 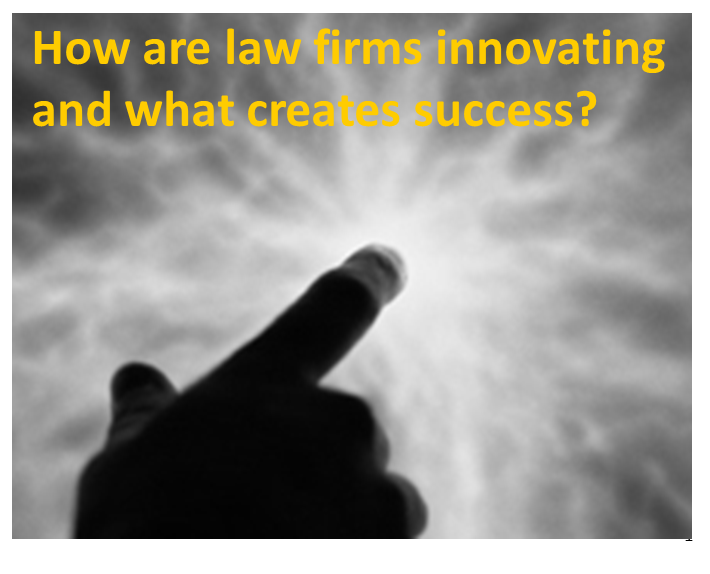 35 law firms in the UK and Germany were surveyed for their innovation methods and results during 2013. Innovation was defined as anything new to the firm that generates value. Overall UK and German firms, scored similarly – at a middle to low level compared to best practices. UK firms focused their innovation mainly on process improvement and German firms on services. 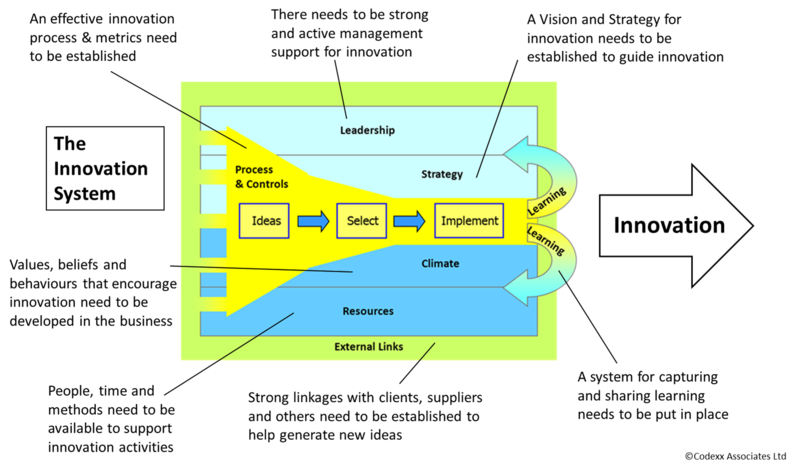 The study showed that improved innovation practices resulted in better business performance. 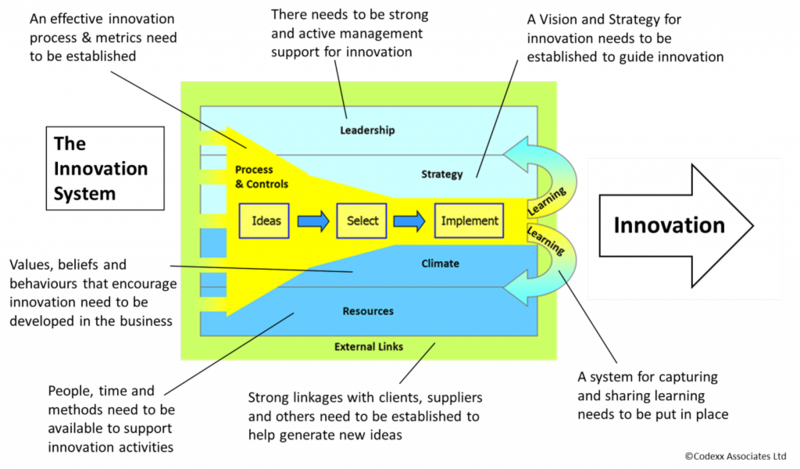 Firms’ key challenges in improving their innovation were in resourcing, culture and leadership. 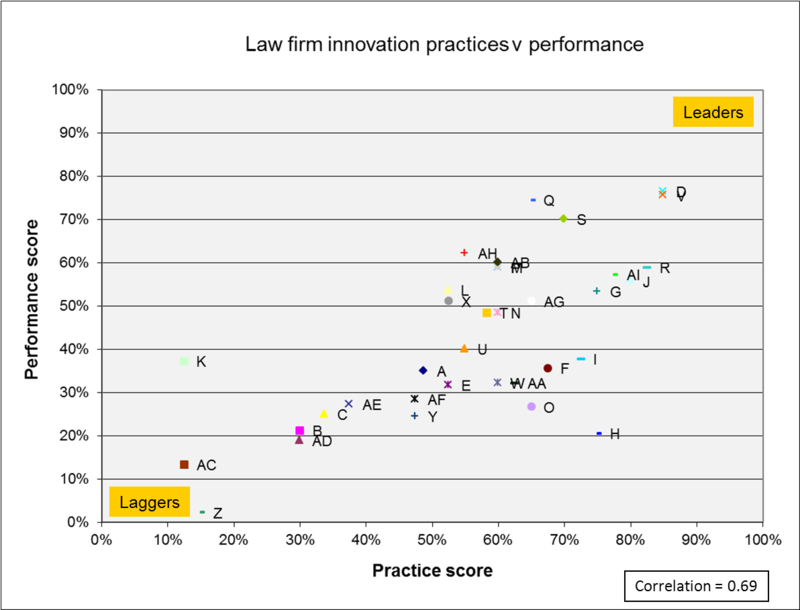 A study of innovation practices and performance in law firms in the UK and Germany was performed during 2013, led by Codexx in partnership with the University of Exeter Business School and the University of Leipzig Graduate School of Management. The study involved a total of 35 firms, 14 in the UK and 21 in Germany. Firms participating from the UK were typically larger than those from Germany with a median yearly revenue of £70m compared to £17m. We defined innovation as anything that was new to a firm and brought value – this broad definition covered incremental as well as ‘step-change’ innovation. This study followed a previous one run by Codexx in 2006 with 16 UK law firms. The objective of the 2013 survey was to perform a more in-depth study of UK firms’ approach to innovation, particularly since the 2008 economic downturn and the legal services deregulation. The opportunity to perform a similar study with German firms and contrast approaches and outcomes brought additional value. The study found an overall similar level of innovation practices and performance in the participating UK and German firms, which was typically at a middle to low level, compared to best practices. Whilst UK firms had their main focus on process innovation, German firms’ focus was on service innovation. The difference, we believe, results from the impact of the legal services deregulation and the post 2008 economic challenges in the UK, with firms giving increased focus to efficiency. The study also found a good level of correlation between innovation practices and performance – showing that if these practices were put in place, it was likely that improved performance in key metrics such as revenue from new services and cost reduction from process innovation, would follow. 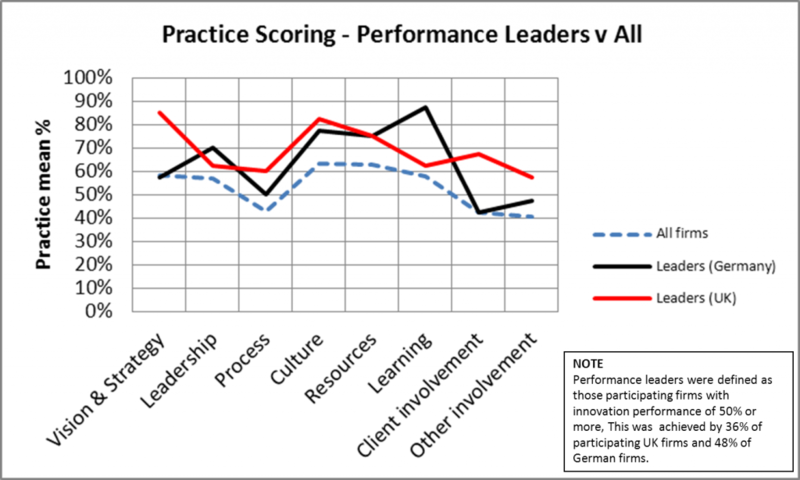 Analysis of those firms who were leading in innovation performance, showed that UK performance leaders had an average level of practices ahead of the study sample in every practice area, though this was not the case for German leaders (this might indicate some practice inconsistencies in the generally smaller German firms). This finding gives support to the recommended comprehensive approach to innovation, establishing a system to cover the the key practices. Firms identified their key innovation challenges as in resourcing innovation, establishing a supportive culture and process and in leadership. Improving innovation resources and process were cited as common improvement priorities for firms. The report defined five guiding principles for law firms seeking to improve their innovation capabilities, based on Codexx experience in working with law firms in innovation since 2005. For more information on the study or to request a copy of the report, contact Alastair Ross at Codexx. You are currently browsing the Codexx blog archives for October, 2014.